I don’t ever remember thinking that the first words of Jesus’ statement had any kind of a personal message for me. They were simply His answer to a specific question He was asked about obeying civil authority — about paying taxes to Caesar — who, at that time in history, represented the civil authority governing them. That’s the way it was for me – UNTIL, as I began wondering what I could chat to you about this month, those same words of Jesus came to mind. This time, however, my thoughts seemed locked into only those words which, ordinarily, I tended to ignore because they weren’t in any way ‘speaking’ to me. I knew this must be happening for a reason so I got myself some ‘thinking’ food (Oreos and milk) and sure enough, it worked. I could stop my ‘wondering’. In little more than a cookie and a half here’s what dawned on me. 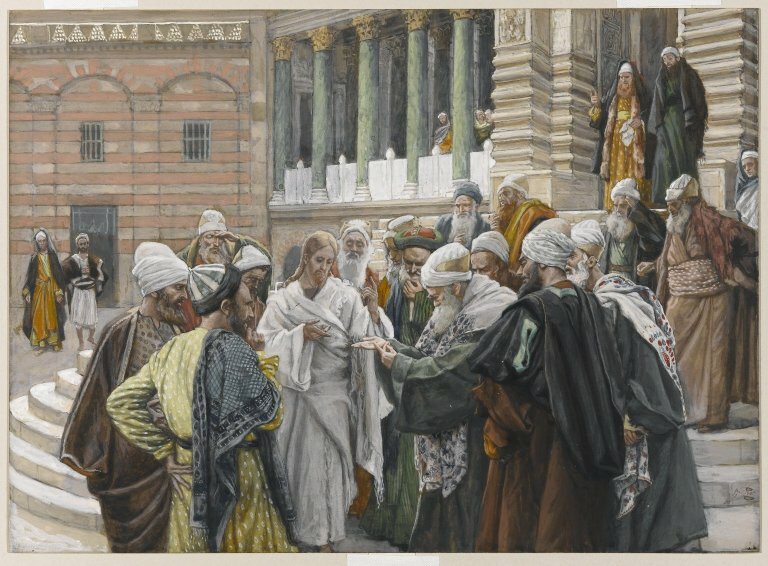 When Jesus told the Pharisees to “give to Caesar”, He wasn’t talking only to them anymore than He was talking only to the wealthy man who asked about possessing everlasting life when He told him to “love his neighbor”. I came to realize the same thing was true each and every time Jesus spoke – whether His were words of compassion, understanding, reprimand, forgiveness or instruction. Through the mystery of the Trinity, His human words, were delivering a message from God meant to be heard and heeded not only by the people in His presence at the time but by all generations to come. So it follows that when, so many years ago, Jesus said to those gathered around Him, “give to Caesar”, He was also talking to me, to us, about our responsibilities concerning governmental authority. Here seems a good spot to insert something worth remembering. Jesus didn’t say, “Do NOT pay taxes” or, to the best of my knowledge, did He ever speak out against the existence of secular authority. In fact, Paul, in Romans 13:1-7, speaks very explicitly along those same lines. These were the kind of thoughts I was hoping for because I knew I would be ‘talking’ to you in July and, for me, the highlight of that month is the ‘4th’. I always hope and pray that special day will conjure up in the minds and hearts of all Americans great pride, joy and thankfulness to God as we commemorate victory in the hard-fought battle which gave our great country its independence and allowed it to begin to form its very own government. I was also conscious of the fact that this is a very important election year when we will be putting into office people who will represent that government, our Caesar if you will, in the sense that they will be the ones making decisions defining the specifics of governing civil authority. So much for patriotic thoughts and well-intentioned words. Now comes the ‘doing’ which can get somewhat burdensome since God pretty much put us in charge of decision making by giving each of us a free well. He did promise, though, that He’d always be here to help and Thank You God for that. But basically we’re the ones stuck with trying to figure out the fine print of ‘giving to Caesar’ — the what, the how and the when of it all. Looking at the overall picture, I think, the ‘doings’ expected of us range from scrutinizing candidates, bureaucracy and laws to dealing with the present while learning from the past and, at the same time, planning for the future. Oh yes, and, along the way, seeing to it that ‘Caesar’ doesn’t overstep or abuse what ‘legitimate’ power God delegates to him. All this while every form of communication bombards us with very convincing ‘experts’ feeding us contradictory ‘facts’. Not easy!! If you share my frustration, there are probably times when you shake your head, shrug your shoulders, try to convince yourself that ‘giving to Caesar’ isn’t way up there on God’s priority list and very seriously think about turning the whole thing off. BUT WE CAN’T! We must keep on doing our best to remain prayerfully informed and prayerfully involved. You know, of course, where I’m headed. WE MUST VOTE!!! — whether we just vote against someone or something rather than for a person or an issue. WE MUST NEITHER THROW AWAY OUR VOTE NOR WASTE IT!! !